There’s a storm brewing on the Firaxis Twitch channel, and it’s starting to get pretty nasty. The stream started yesterday, displaying a cloudy sky and a city below. Now, that city looks like it’s in imminent danger. Why is Firaxis threatening this city with foul weather? Has Sid Meier packed in the day job and embarked on a life of super-crime? 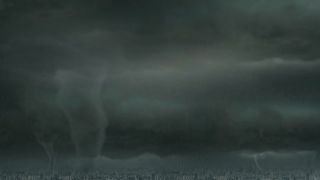 A few hours ago, a tornado appeared. Now the screen is full of tornadoes and lightning and clouds that look like they’re ready to explode. Do clouds explode? I bet these ones do. No word on the digital city’s poor denizens. If this isn’t Meier revealing his plan to hold the world hostage for a paltry million dollars, it's maybe a different kind of reveal—the video game kind! Expansion? New game? An epic 4X about clouds? Perhaps the fact that it’s also being streamed on the official Civilization YouTube channel is a hint. I’ve had it running in the background for a while now, and you know what? Maybe storms aren’t that bad. I’m finding the low rumble of the wind and thunder very soothing; it’s an excellent soundtrack for writing. Given the intensity of the storm right now, it seems like it’s approaching its zenith, if it hasn’t already, so keep an eye out for a proper announcement soon. In the meantime, get speculating!